John and I have been married for 26 years. It hasn’t always been easy, but we’ve learned a lot of things a long the way. We believe the heart of a great marriage is learning that love is an action. It’s a choice we have to make daily. Through a series of short blogs, I will share lessons that we’ve learned that have helped us choose to love. We hope that you will find some ideas that you can put into action that will help strengthen your marriage! My first suggestion is something that has helped John and I be better partners and even better parents. Learn each other’s “love language”. Gary Chapman has written a book called The Five Love Languages. I’d highly recommend it to everyone! It helps you understand how you and your spouse tend to receive and give love. Once I understood that we each prefer to give and receive love differently, it was much easier for me to see when my husband was trying to give me love and how I could best give him love in a way that he preferred. 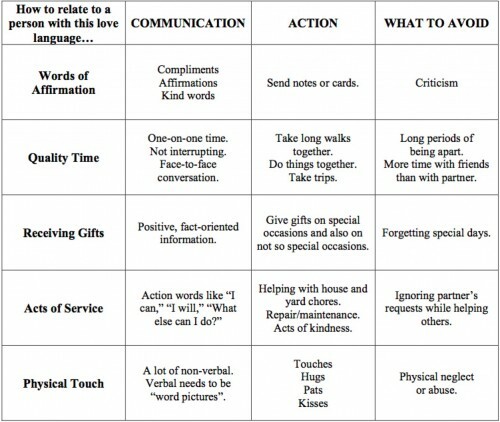 My love languages are words of affirmation and acts of service. My husband’s are physical touch and quality time. By understanding this, I can choose to love John by spending more time with him, holding hands, rubbing his back, and of course understand his need to feel loved through making love. John can choose to love me by telling me that he loves me, how much he appreciates me, how much he cares about me. He knows the way to my heart is through acts of service – helping around the house, preparing the meals, bringing me nutter butters when I’m stressed out, and supporting me with my work and homework. Learning love languages will help you with all your relationships – spouse, kids, work, friends, everywhere!